They say everything is bigger in Texas and that is certainly the case here. We’re going to take an inside look into one of largest homes in Dallas’ exclusive Highland Park neighbourhood. The 29,000 square foot limestone mansion was designed by Larry E. Boerder Architects and built by Sebastian Construction Group for Texas billionaire Gerald J. Ford and interior designer wife Kelli, who operates Kirsten-Kelli with sister Kirsten Fitzgibbons. While all the main principal rooms do not disappoint, what lurks beneath the home is quite spectacular. 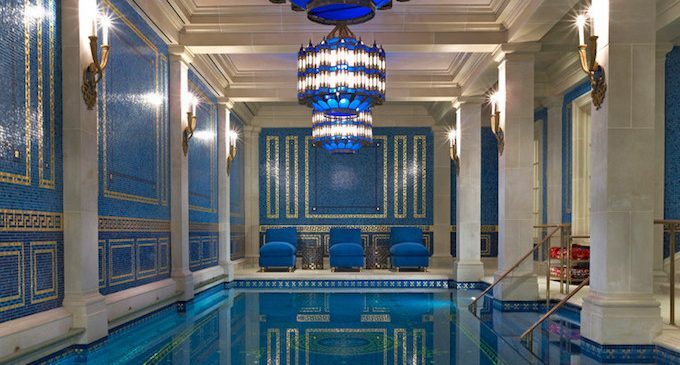 The Fords designed a 2,000 square foot space inspired by the Roman Pool at the Hearst Castle in California. Walls are covered in custom made blue and gold tile mosaics that Kelli and Kirsten created, while the floors and columns are made of Texas limestone. The three chandeliers hanging above the pool were custom made in Syria and according to NY Daily News, a waterproof ladder is required to change out the bulbs. If you recognize the pool, that may be because it has been featured in a 2012 issue of Veranda and showcased on HGTV’s Million Dollar Rooms. “It’s not really a pool to jump in and do laps, it’s a pool to relax and hang out in,” said Ford, who gave a tour of the space to HGTV’s “Million Dollar Rooms.” All in all, this was a substantial project with a substantial budget. MCAA reports that stone and masonry work spanned two years at a cost of $5,000,000 while DMagazine values the home at just over $31,000,000. The property also includes a lovely outdoor pool with cabanas.